In the mean while, the Internet is overrun by cheap and simple programmers for so called Smartcards. The Gold*Card, also know as Millennium programmer, is one of them and can be bought for about $75 to $90. 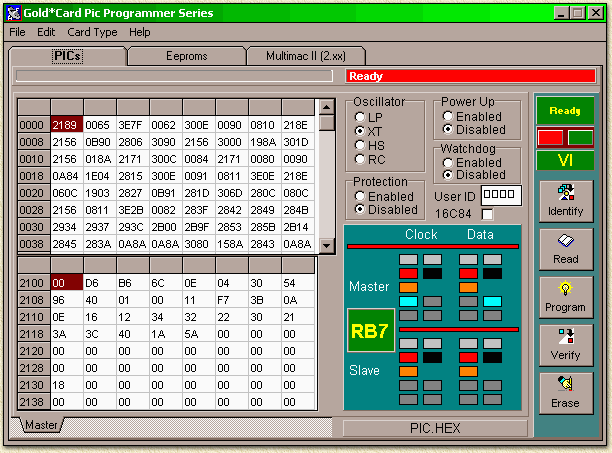 Actually this programmer has been build for the illegal programming of illegal cards for the D2MAC satellite system, but it's still very usefull for programmings PICs and EEPROMS, and even more specific the so called Smartcards (GW-card, Gold-Wafer card or just short: GoldCard). 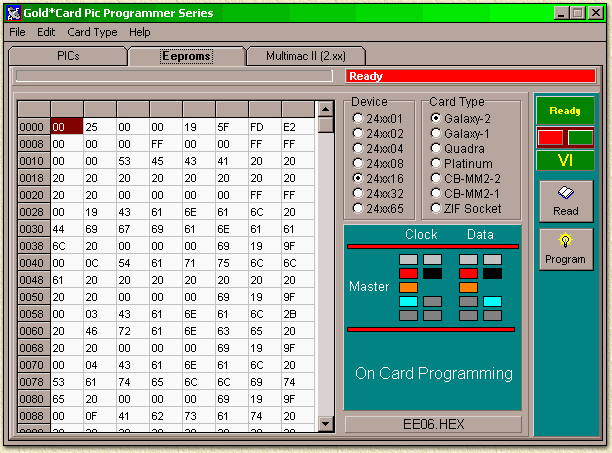 Below you will find a very brief explanation on how to program a PIC ans an EEPROM. Download the software here: Gold*Card 1.40. Though this programmer can be very usefull for making your own smartcard protection of for example you PC or other objects, it also can be used to created illegal smartcards or edit existing smartcards which can be ILLEGAL! 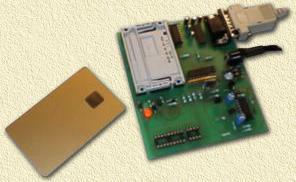 A goldcard smartcard has a PIC (kind of "mini-computer", see also the Basic-Stamp pages) and an EEPROM (a memory bank). The programmer can be bought on the Internet for example at TechTronics and Electronic-Devices. You can also use the programmer to read smartcards, keep in mind to READ THE PIC FIRST! If you would read the EEPROM first, you will overwrite the original bootloader and your card will become useless - and you will need to restore the original bootloader. After reading the Smartcard, the card is being rendered useless. You must restore the original bootloader to get it running again. The programmer is not able to talk to the EEPROM directly and uses the PIC to access the EEPROM. To put data on the EEPROM we need to tell the processor how to transfer data from the PC to the EEPROM. Therefor we load the PIC with a so called "bootloader" - a little program that transfers data to the EEPROM. A similar program is used in the PIC to return data to the application which we use the smartcard for. Start the "Gold*Card PIC programmer", and don't forget to make the proper com-port settings. Note: the serial cable should be a regular 1:1 cable, do NOT use a NULL-MODEM cable! Note: If the software does not find the programmer, it will start in "Demo mode". Make sure the settings are OK. For a so called GOLDCARD we need "Device" - "24xx16" and "Card Type" - "Galaxy-2". Now click the "Program" button to start programming the EEPROM. In the red statusbar you will see the programming progress. Wait for it to return to "Ready" state. Note these are the settings for a GOLDCARD, set "Oscillator" - "XT", "Protection" - "disabled", "Power Up" - "Disabled", "Watchdog" - "Disabled", "User ID" - and make sure there is NO CHECKMARK for the "16c84". Now click the "Program" button to start programming the PIC. In the red statusbar you will see the programming progress. Wait for it to return to "Ready" state. Well, you did it, you programmed your first smartcard... Use the same technique for programming seperate PIC or EEPROM chips which you put in the sockets - verify the settings for the types you are using.